Using the nanobond range of nano-treatment products, our treatments will render your surfaces easy to clean and largely self-cleaning, requiring !h[only water to keep clean]. 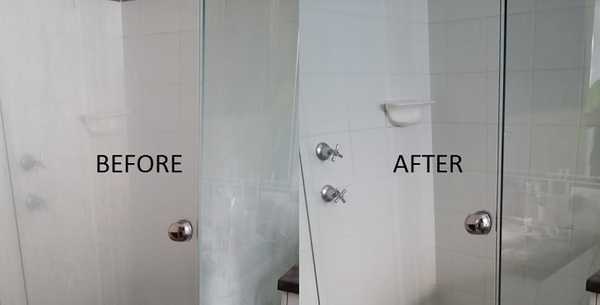 Clean, treat and restore your glass shower to remove existing soap scum build-up and help prevent future build-up, while at the same time reducing your future cleaning requirements by 90%. Wash and treat your timber deck or fence, to help repel water and dirt and significantly reducing the growth of mould, mildew, fungus and bacteria...all without changing the beautiful timber look and feel. Treat your residential or commercial kitchen's stainless steel surfaces, causing the surface to repel water and dirt, reducing bacteria build up and making it significantly easier to clean. Clean your external metal frames, gutters or other fixtures to remove existing discoloration, stains, oxidations and other contaminants. Then treat them to provide a long lasting, ultra thin protection and a durable, easy to clean surface that stays shiny even in harsh marine environments. Clean and treat your car, truck or bus windows and mirrors, giving them a self-cleaning effect, increasing scratch resistance and significantly improving visibility in rainy conditions due to water-repelling effect. Clean, restore and treat your glass balustrades, facades and fences, as well as ceramic bathroom wares and tiles, creating an easy to clean surface while at the same time protecting your surfaces against scratches and increasing the hardness of glass. Give us a call to discuss your requirements if you have any surfaces that you want to protect, reduce your cleaning requirements, and increase their lifetime. We provide warranties of functional performance depending on the type of surface. We can also provide you with a free quote and advice.